You are at:HomeUncategorizedThe Cheeseboy is HERE! Actually, he frequently visits the Break Room anyway, but never before has he written for my blog. I have never had a guest poster before. He is my first one!! I felt it was high-time to share this space and the wonderful, witty and fun readers of this blog with someone else, although many of you probably follow his hilarious blog already. Seriously, y’all, I am so excited to have him here. All of his material is hilarious, clever, witty, creative and original. All of it. So, naturally, I am honored that his cheesy self is in the Break Room, which reminds me, despite his large head made of cheese and your intense hunger pangs, he is NOT a snack! I repeat! He is NOT snack! Put DOWN your crackers! I am honored that Kelley – a normal human being with no real cheese features – has asked me to be her very first guest poster. We shall forever be slightly insane blog buddies. 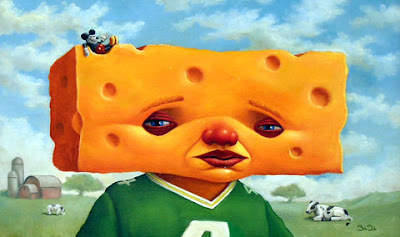 Some say being made of cheese is a curse, but I look at as a blessing – if blessings totally sucked and smelt like Rosanne Barr’s running socks. You don’t think I hear the hateful whispers? In Target while I am looking for a car seat for my little curds; at the Dollar Tree while I am looking for a cheap funnel to catch my moldy tears; playing air hockey at the arcade in the mall. Oh, I hear them and they cut the cheese to the very core. Words sting. The especially sting on the flesh of a tasty, aged cheddar. But nothing anyone has ever said has stung more than what NBC has done to my fragile, oily heart. I am ashamed to say that my body fat percentage rate is a whopping 92%. In recent years I have really let myself slide and I now stand before you – a shadow of my former self – ready and willing to make necessary changes to allow myself to age gracefully. That is precisely why I sent in a Biggest Loser application to NBC’s The Biggest Loser. All things were a go until the unthinkable happened: When NBC President, Jeff Zucker received word of my participation, he quickly nixed the idea, calling it, “silly” and “ridiculous” and “the most stupefyingly stupid thing I have ever heard”. I hate to make accusations, but Mr. Zucker is a Cheese-ist! He hates cheese. He sits in his anti-cheese mansion with his anti-cheese butter. So what if the other contestants might be tempted to eat me? Wouldn’t that just put an added twist into the show? Just wait until sweeps week! He’s going to wish he had a giant, human-like block of cheese for Jillian to berate and belittle until she herself has a coronary. Think of the ratings that would bring in! I offered Mr. Zucker the opportunity to make me a simple gimmick – I told him that I would happily donate my kidneys to their precious Subway restaurant that the contestants are always frequenting. He, of course, declined. Anyway, I was on board for the show and now I am a lone cheese in a world of sorrow. Cheese can hurt and today, I hurt badly. Cards of sympathy and notes of well wishes can be made at The Blog O’ Cheese. I thank you for your support. Click here to send your cards of sympathy and notes of well wishes to The Blog O’ Cheese (and to read more of his super funny stuff). Pssst… The Cheeseboy has 429 GFC followers. When he gets to 500, he will dress in a Barney costume and get Chinese take-out! And he is true to his word… When he got to 400 followers, his wife was videotaped while mercilessly waxing his arm hair. Help the idea of the Barney costume prank become a reality!